Hello! I’m Melanie. I’m a wheelchair tourist who loves to travel around the globe. 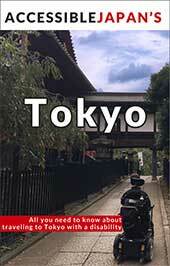 Tokyo is one of my favourite travel destinations. I’ve been there four times and would like to share my experiences with you. 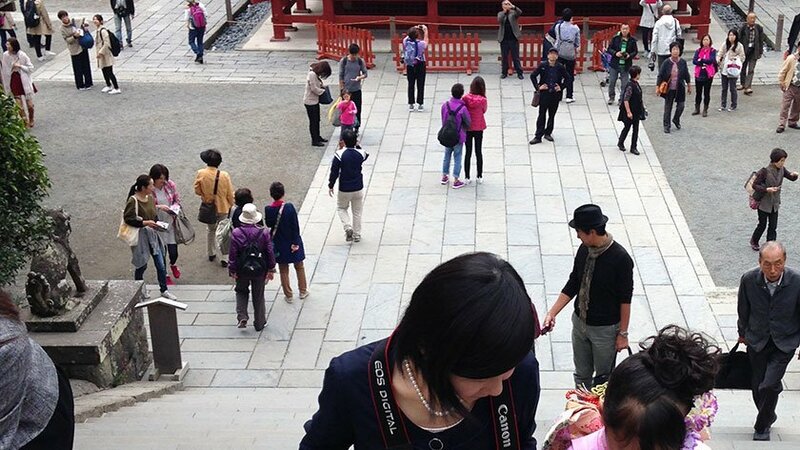 When you are staying in Tokyo for longer, you might enjoy a day trip to Kamakura. Kamakura is a small but famous village on the oceanside about one hour south of Tokyo. 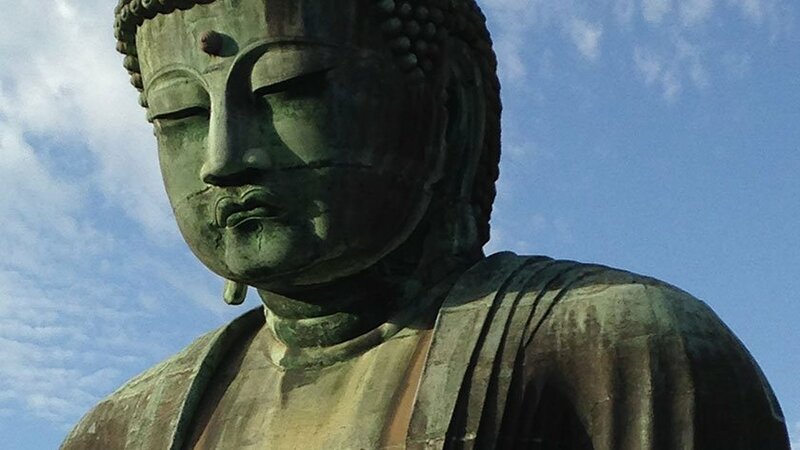 Kamakura offers many shrines, temples and is home to one of Japan’s most famous icons, the Great Buddha statue. 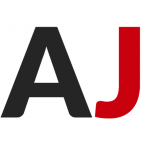 You can easily get to Kamakura using the JR trains. I recommend the JR Yokosuka Line which connects Tokyo Station directly with Kamakura Station. The ride takes about 55 min and costs 920 yen one way. Make sure to present yourself to a staff member who will lead you to the right train platform and help you to board the train. Once arrived at Kamakura Station, another staff member will already wait for you to help you out of the train. 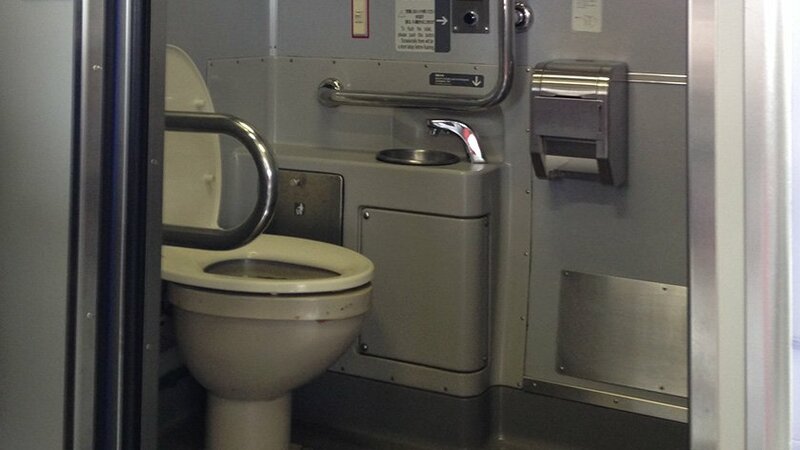 The train offers at least one wheelchair-accessible restroom. 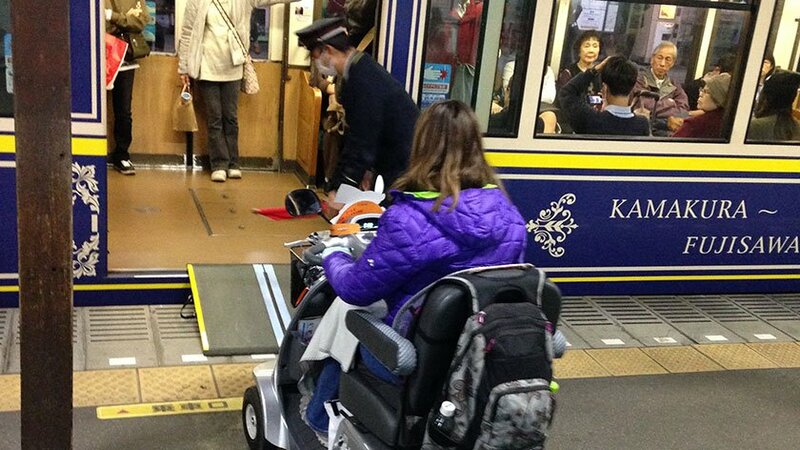 Kamakura Station is fully wheelchair-accessible and has two exits. 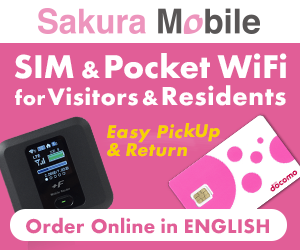 Take the Kamakura Station East Exit for the Tsurugaoka Hachimangu Shrine and the Kamakura Station West Exit for the Enoden Line to the Great Buddha at Hase Station. Only the Kamakura East Exit is equipped with wheelchair-accessible restrooms though. One wheelchair restroom is inside the station near the exit gates and another one is outside the station on your right. The Tourist Office will provide you with a map of Kamakura and will help you if you have questions. I can recommend the following wheelchair-accessible roundtrip from Kamakura Station to Kamakura’s most important shrine and back: Exit Kamakura Station and look for the big red gate next to McDonald’s on your left. Enjoy a 20-minute walk along busy Komachi-dori shopping street which leads you directly to the spacious Tsurugaoka Hachimangu Shrine. Walk straight on until you see a red fence with many parking lots on the right side of the street. Here you can cross the street (but careful, there is no crosswalk) and take the path to the temple. There’s another entrance before (the one with a crosswalk) but it has steps! The main sanctuary has a giant stair case and unfortunately no wheelchair access. There is an evacuation road leading around the building, but it is closed for visitors. Back at Kamakura Station you might want to see the statue of the Great Buddha which is located near Hase Station. The Enoden railway line, located at Kamakura Station West Exit, will take you to Hase Station in a 5-minute ride for 190 yen one way. Turn right at the Hase Station Exit and follow along the street (or the crowds as there are always tourists). There are many food shops offering traditional and modern snacks. I tried a roast octopus rice cracker, a typical Enoshima specialty – very weird! 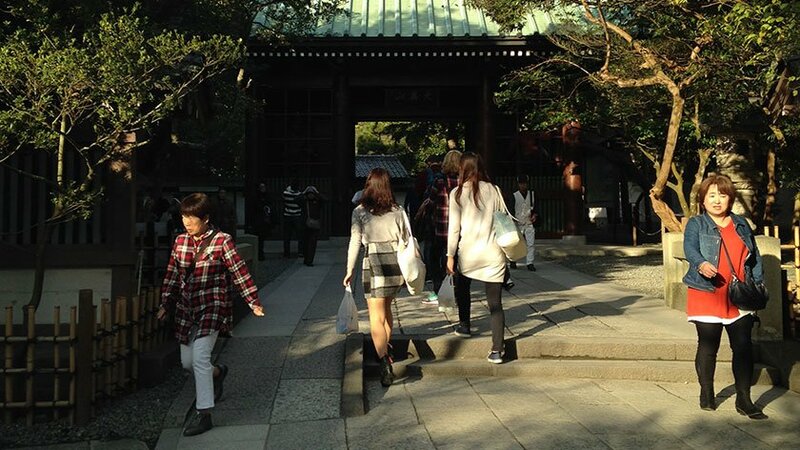 After about 10 min, the Kotoku-in Temple entrance appears on your right. The entrance fee is 200 yen. Wheelchair users can get a free entry ticket by presenting a disability card in English. 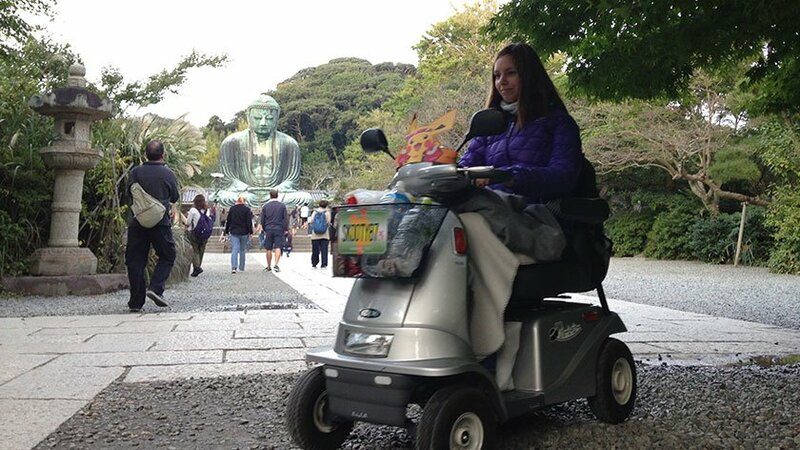 The Kotoku-in temple is fully wheelchair-accessible with ramps and restrooms. The Great Buddha of Kamakura, also known as Kamakura Daibutsu, is an impressive about 13 m high bronze statue of Amida Buddha and is one of Japan’s most famous landmarks. Another place of interest is the Hase-dera Temple. The temple is built on a steep hill with stairs and it is unfortunately not wheelchair-accessible. A little extra tip: Before taking the way back to Tokyo, you could have a quick look at Sagami Bay. 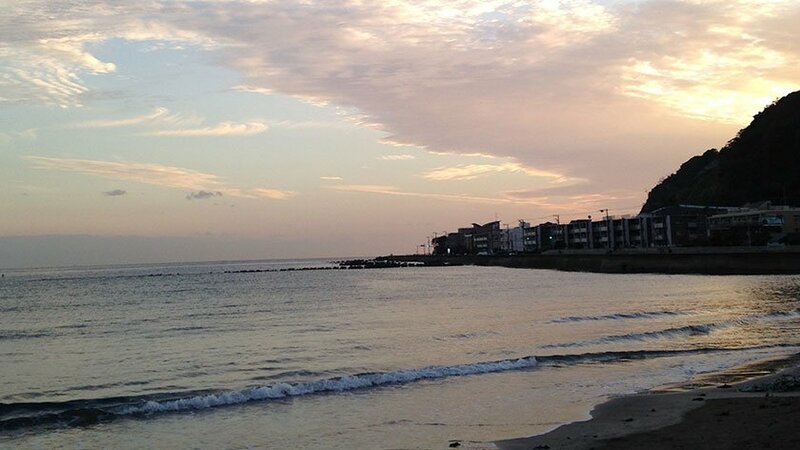 The oceanside is located only 5 minutes from Hase Station. 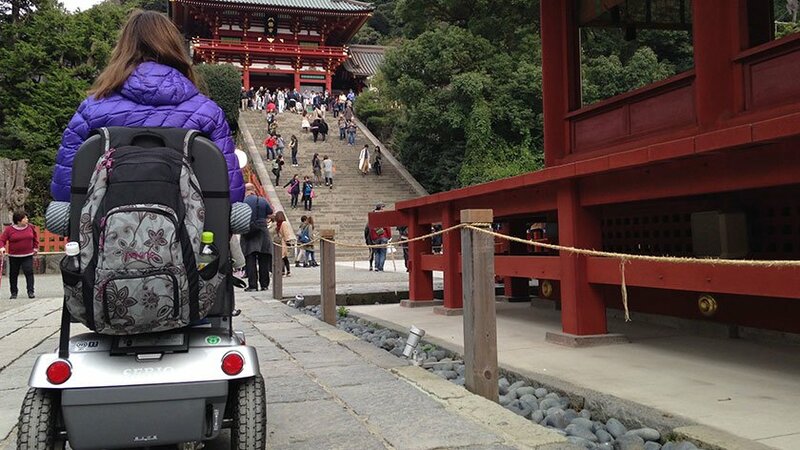 With these wheelchair-accessible travel tips you’ll hopefully spend a great day in Kamakura! If you like you can find out more about me on my blog www.littlemissturtle.com. Melanie is 29-year-old, French-German globetrotter on wheels. On her blog, Little Miss Turtle, she shares about her eventful, funny, often weird and sometimes sad life with Limb Girdle Muscular Dystrophy. She was diagnosed at the age of 4 and got her first wheelchair at 10. She has a traveler’s heart and loves to discover new places all around the world. Follow her journeys on her blog, Facebook, and Instagram!